The world is living in transformed times of great flux and rebalancing of traditional relationships, with multiple friction points and security threats. The emerging world order will remain one where the military and economic resilience will continue to dominate the global system and in which nation-building will become ever more relevant. In such a world order while security, justice, economic development and a democratic polity will be the pillars of nation building; security will be foundational for the other three to prosper. The rationale for existence of the military thus lies in the concept of a nation state where there is harmony and balance between security and growth. This underlines the importance of a motivated, modern and relevant military to a nation state. In today’s security paradigm, as India gains respect and finds its rightful trajectory in the comity of nations, the Indian Army’s role and capacity would be central to the nations stature, projection of the national will, and act as a vital mechanism in preservation of our national interests, thereby building a strong, modern and resurgent India. Thus the nation will derive its strength from its Armed Forces and its ethos of “Nation Above All”; conversely too, Armed Forces will in turn seek and derive their strength, pride and motivation from the nation with ethos of “Respect and Care for the Soldier”. What remains critical in this mutual bonding is the faith, respect, trust, and confidence in the system backed by demonstrated will of the Government. The roots of the modern Indian army can be traced to the forces employed by the English (later British) East India Company, chartered in 1600. The uprising of the Indian soldier against foreign rule was one of the most inspirational events which bore the stamp of evolution of nationalism and the birth of the idea of India. As a new nation was carved out on August 15, 1947 with inherited fault lines, partition holocaust cast a challenge to a coherent national identity. The nation had only its Army to look unto in these defining moments of its history, who ensured safety of its countrymen and communal harmony. Post-independence, the Army has repeatedly found itself at the forefront of some of the gravest challenges to our sovereignty that have threatened the very core of the Indian nationhood. Soon after independence in 1947-48, the territorial integrity of India was challenged. The Indian soldier rose and stopped the plunder of Baramulla by Pakistani forces and saved the fall of Srinagar. He took tanks to the unimaginable 11,575 feet high Zoji La pass to push back Pakistani invaders and saved Leh and Ladakh. As part of nation building, the Indian Army also launched a series of successful operations at Junagadh (1947), Hyderabad (Operation Polo, 1948), Goa (Operation Vijay, 1961) and Sikkim (1975) to integrate into “One India”. In 1962 Indian Army most courageously fought the Chinese, despite being ill-clad and equipped for winters in high altitude and nation’s neglect on matters military. Battle of Rezang La is a testimony of the ‘last man last round’ resolve to uphold national integrity. Later in 1965 when challenged by Pakistani aggression, our brave soldiers created a tank graveyard of Pakistan’s Patton tanks (Patton Nagar) at Asal Uttar, with more than a hundred tanks either destroyed or captured. In the same war they also captured the invincible Haji Pir pass through gut and valour. The evil design of Pakistan was once again shattered. Indian Army soldiers fly the Indian flag from a peak in Drass after it was recaptured by Indian troops during the first week of July 1999. 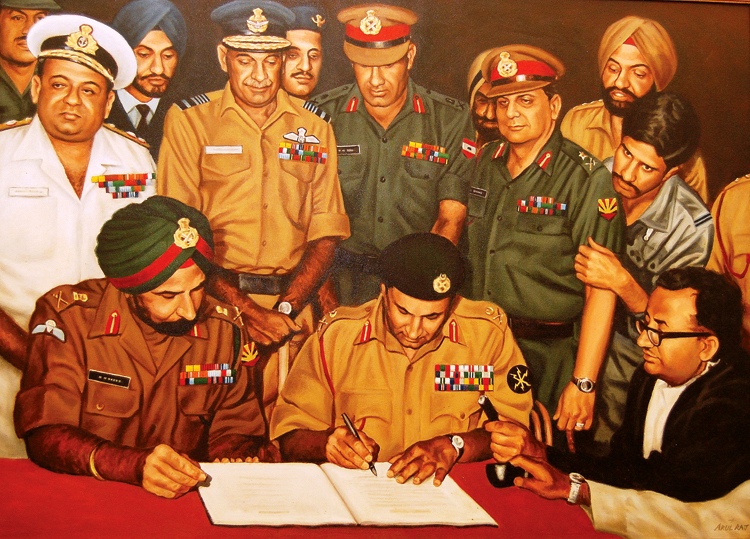 In 1971, Indian Army created history to liberate Bangladesh and give Pakistan their most crushing and humiliating defeat on both fronts. Pakistan was cut to size and a new nation was born. The resultant surrender of 90,000 Pakistani soldiers was largest since World War II. The high level of op preparedness was yet again on display in 1984 at the highest battlefield, over 19000 ft high in the area of Siachen glacier. The brave Indian soldier occupied the Saltoro Ridge defying the harsh and often cruel vagaries of nature which surprised Pakistan and left them dumbstruck. This has today provided us major strategic advantage, reducing the threat to an already sensitive J&K. In 1999, in yet another misadventure, Pakistan’s regular soldiers entrenched themselves on mountain tops of the LoC in Kargil. 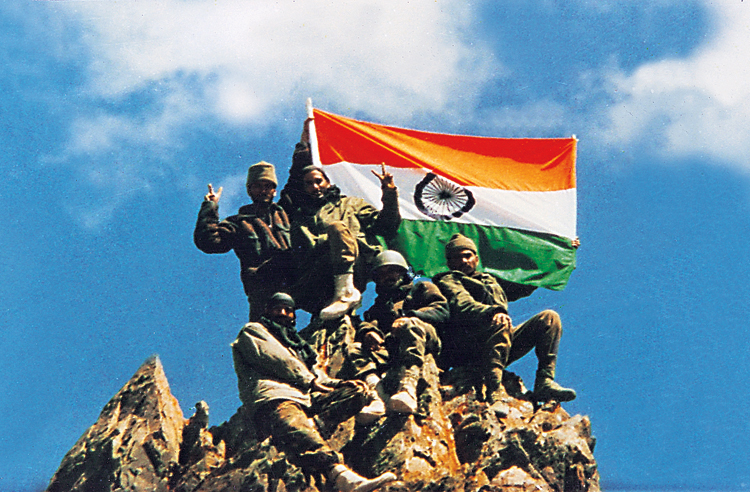 As the world watched in veneration, the Indian Braveheart fought the wellentrenched enemy in hand to hand fights in perilous rugged high altitude terrain and inclement weather, displaying exemplary courage and valour to throw the enemy back, paying a heavy price but underlining the will and resolve of an entire nation. While external threats have kept us engaged on the borders, it is the threats to internal security that has posed the greatest challenge to the nation. The proxy war and insurgencies that the Indian Army along with RR and AR is combatting on a daily basis in J&K and the North East, in conditions most demanding and adverse, are often unfortunately reduced to a passing mention by the media. Let it not be forgotten that for the soldiers deployed in these sensitive areas, it is an ongoing battle of life and death day after day. The existence of these states as part of the nation is at the cost of exacting price that many a brave soldiers have paid through blood and guts embracing martyrdom. The role and responsibility of the Indian Army is not limited to the national borders. While being operationally committed, the Army continues to be the ultimate responder in times of natural calamities, a sheet anchor during national crisis when all other organs of the nation appear helpless. Intervention operations in the Maldives and Sri Lanka at the behest of their governments and evacuation of beleaguered Indian citizens from the war zones are examples of out of area contingencies. To support India’s efforts for world peace as a responsible member of the global community, the Indian Army is one of the largest troop contributing Nation to United Nations peacekeeping. Defence diplomacy and military to military cooperation between India and other friendly countries is another facet that has helped in strengthening bilateral cooperation enhancing international image. In addition, the other organs manned by Indian Army like the BRO, NCC and DGQA have done yeoman service to the nation. As the Indian Army proudly celebrates its seventy first Army Day, it’s also time for introspection by the nation state, its people and society at large including media, politicians and bureaucrats. The need is to reflect upon the nations outlook to this most respected institution and systemic erosion in its stature over the years. There are certainly some policy positives in the recent past by the government. These include new defence procurement policies to foster indigenous capabilities particularly to boost the nascent defence industry, a more responsive intent for defence modernisation, implementation of OROP even if truncated, National War Memorial being expedited and some more such actions. However, these lie buried under the many more serious policies which dilute and tarnish the image of defence services resulting in a sense of victimhood. Possibly the most dangerous trend has been in politicising of the forces both in terms of promotions to higher ranks, as also deriving political mileage from covert military operations albeit surgical strikes. Such operations are done clandestinely and kept under wraps to keep the enemy guessing of its modus operandi and generating a fear of the unknown for the next such operation. While the courage and professionalism of our brave soldiers needs to be lauded, but to make a media spectacle of it and have a political debate on its veracity is certainly shameful. It was professionally imprudent to give out details of its planning and conduct or celebrate its anniversary. The recent trend of matters military being subjected to petty politics and ill-informed media debates needs to be ruthlessly curbed. The present government to its credit granted One Rank One Pension (OROP), though perceived by some as truncated. Whatever may be the merits/demerits of the ongoing agitation by a group of veterans regarding the truncated OROP, the treatment meted out to them at the hands of the Delhi police at Jantar Mantar on October 30, 2017 was not only a dark day for Indian democracy but disheartening and demoralising for the entire uniformed fraternity. Todays soldier is tomorrow’s veteran, and such actions only makes the nation bleed. To add to the concerns, the bureaucracy has successively downgraded the status and financial equivalence of the Armed Forces with every Pay Commission report. Even the warrant of precedence is repeatedly tweaked to suit the convenience of the bureaucrats. The aim is not to compare with civilian officers as no doubt the armed forces are different, unique and an elite service, but disparities cannot be ignored. 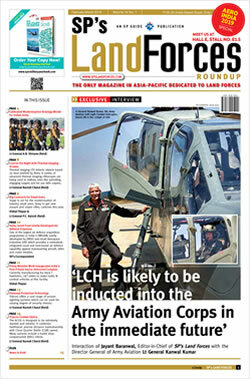 Equally important is the lack of strategic culture and neglect to address critical issues like appointing a Chief of Defence Staff, fostering Integrated Theatre Commands, creation of Special Operations, Cyber and Space Commands, expediting the National Defence University, sustained defence budgetary allocation for modernisation and sustenance, formulation of a national security strategy, restructuring MoD with enhanced representation of Defence Services and enactment of Armed Forces Covenant Act 2012. The recent government decisions on opening up of Army Cantt roads for general public, Army Hospitals for civilians and unilaterally amending the gazette notification containing recruitment rules for CSD General Manager and Chairman Board of Administration, has raised concerns and anguish. There is a perception of systemic erosion of defence institutions. The rise in AFT legal cases against MoD and their appeals against the judgement, are also indicative of the loopholes in the legal system. Yet instead of strengthening AFT, its member vacancies remain unaddressed, resulting in a backlog in addressing cases expeditiously. In another unprecedented move last year, several serving Army-men, in personal capacity, have moved a writ petition to the Supreme Court over their fundamental rights, asking whether a soldier’s discretion can be put under legal scrutiny. Is this indicative of lack of confidence in the organisation, who should have been at the forefront thumping the table to protect their soldiers being prosecuted for performing their duties in disturbed areas? Such events only lower the morale of military. Internally, the Army too needs to address issues which could tarnish its image. There are several areas within the internal domain which merit and are being positively addressed by the hierarchy to foster transparency, balanced representation and equal opportunities for all to excel, beyond the lanyard syndrome. Urban life style, corporate culture, internet, media and steep pyramidical structure also pose their own challenges on the soldier. Internal reforms, addressing systemic fault lines, strengthening the value system, perception management and above all taking a no nonsense stand when adverse policies eroding the stature of soldier are enunciated, are the basic pre-requisites for preserving the revered image of the Armed Forces. As India emerges to find its rightful place in the world, the Indian Army will continue to be foundational towards building a strong, modern and resurgent India. Its defining character built upon the 5 C’s; Character, Competence, Courage, Commitment and Compassion; and ethos of a secular, motivated, apolitical and professional force devoted to the unity and integrity of the country, would remain the defining fundamentals of national growth and prosperity. The respect, dignity, wellbeing and stature of its soldier in turn must thus be preserved and garnered by the nation.